Sometimes all a boy wants is something familiar, sturdy, and steadying. Michel Rostang fit the bill. Julien of Julot les Pinceaux was instrumental in my decision to add Michel Rostang to my roster of dinners in Paris. I had expressed a desire to have at least one high-end dining experience that would give me a more lusty, traditional, and hearty look into French cuisine. And I must say, Julot hit the nail on the head. Rostang plays with a heavier hand, plucks the heartier strings, and produces a richer melody. Chef Rostang possesses impressive pedigree: he descends from five generations of French cooks, including a father who held 3 Michelin stars in Antibes. His eponymous restaurant in the 17eme of Paris is well-established: It was born the same year I was – 1978 – and earned two Michelin stars by 1980. All of this was obvious from the dishes that Houston and I saw over the course of our dinner. I had one dish pre-arranged for me: lièvre à la royale. It was getting to be the later side of the season for hare. But, it has a special place in my stomach, and it is not available (or very rarely seen) in the United States. This was the one dish I desired the most on my trip. Having received a few recommendations for Rostang’s hare in particular, I asked Julien to secure a portion for me. While two-thirds of Rostang’s menu changes quite frequently, the remaining third is comprised of house standards, which rotate according to the seasons. The lièvre à la royale was still being offered á la carte the night I was in. But, I was told that it could be supplemented on or substituted for a dish in any one of their tasting menus. Michel Rostang offers a number of tasting menus. There were at least four different ones. None of them interested me more than the black truffle tasting menu (270€). Given that it was just a touch early in the season, I knew I was probably taking a gamble. And, that Pacaud had refused to serve black truffles (I asked) two days before at l’Ambroisie, probably should have indicated that it was premature for such a commitment. I can’t say these truffles were horrible. But these were not fully alive, as evidenced by the rather inert basket of the truffles presented to us after we ordered. 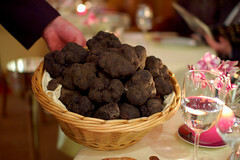 They were more akin to summer truffles in flavor and aroma than winter truffles, which is to say they were a bit musty. CLICK HERE to see all of the photos from this meal or on each dish for the individual photos. Servi avec une purée de pommes de terre aux truffes. fines pates “Taglierini” au beurre, sauce poivrade. de chartreuse et crostillant glace. Notwithstanding the dull truffles, the meal was not without merit. Black truffle aroma gains encouragement from a gentle heating. Both “Le Soup d’Artichauts Violets aux Truffes Fraîches” and “Le ‘Sandwich’ Tiede á la Truffe Fraîche” demonstrated this well. They were two of the most successful dishes from our meal. Though the truffles added a nominal bit of pleasure, the soup was delicious, benefiting mostly from a strip of silky Belotta ham (Iberico) melting into the comfortingly rich, velvety, and concentrated purple artichoke soup. “La Terrine de Foie Gras” was the other outstanding course. Rostang confidently side-stepped cliché and convention by considering the savory side of foie gras, layering it with leeks and topping it with a beefy truffle consommé gelée. In doing so, the natural sweetness in the liver was heightened. As with the soup, the truffles here figured more as an accent rather than the focus. The combination of flavors was brilliant. The rest of the savory courses were uneventful, if not a bit disappointing. As a truffle course, “Le Millefeuille de Coquilles Saint-Jacques Crues” was a failure. Served cold, the truffle shavings were mute and back-seated by the other components. Otherwise, the dish was good – the thinly sliced, raw scallops were fresh and a tasty vinaigrette coated everything, including a miniature green salad. Houston’s “Le Dos de Bar Rôti á la Peu Croustillante” was boring. More troubling, however, is that the sea bass was a bit fishy. And that “Lièvre á la Royale” I had so anticipated and which so many had highly commended, was mediocre. The roulade of hare pâté was tired-tasting and the civet sauce was a bit thin and lacked depth. The saddle and stewed leg meat off to the side were the highlight. The side dishes that came with our last savory courses were much better. Houston celebrated her truffled purée de pommes de terre by scraping the pot clean. It was very good. But I liked my twirl of “taglierini” pasta better. That’s because I prefer something that requires teeth. 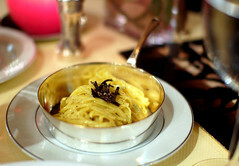 The thin noodles were slicked with butter speckled with black pepper and topped with chopped black truffles. The interior of Michel Rostang has an uncomplicated richness about it. Trimmed with varnished walnut-colored wood, it has a clubby feel – in a old-boy, smoking jacket way. Hoping for a decent view of the kitchen, I requested to be seated in the Robj room, which is adjoined the kitchen with a picture window. The view is nominal, but I liked the cozy atmosphere of this intimate little room. And though they bothered Houston to no end, I rather loved the dozens of Robj porcelain figurines that lined the room’s many shelves. 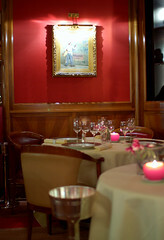 The main dining room is more square and spacious, sparsly decorated with “contemporary” art. Goats’ milk cheeses are favored here, though a few cow’s dairy cheeses are also offered. (“Les Petits Chevres et Fromages“) We sampled more than half a dozen from the two trays brought to our table. Of them, the Beaufort was a particularly noteworthy specimen: sweet and nutty, it had a noticeably pasture-forward flavor. Our desserts were rather uplifting. Regardless of which menu you choose, desserts are á la carte. “La Poire Caramelisée” was fantastic. Aesthetically, this dainty creature took a departure from the rest of Rostang’s presentations. A tissue-thin tuile cigar gave way to a cold, chartreuse-kissed ice cream filling. 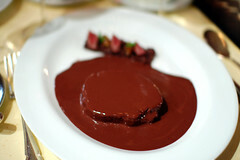 It sat on a bar of milk chocolate dacquoise and was sided by a lovely pear sauce (think apple sauce). Delicate, sophisticated, and fragrant, this was one of the best desserts I had in 2008. “Le Citron de Menton,” fell more in step with the rest of the Rostang’s fare. A homely homage to the Côte d’Azur, this paired olives and those celebrated lemons from Menton together in a a surprisingly successful confectionary coupling. Flecked with bits of black olives, the soft, and fluffy-crumbed cake had been soaked with lemon syrup and hid a lemon curd core. The accompanying black olive sauce and olive oil ice cream seemed superfluous, especially the latter. I make a better olive oil ice cream at home. 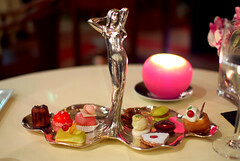 The curvaceous silverware bearing the petits fours embodied Michel Rostang well. The food is wild at heart, reined in by a polished, classical refinement. It’s romantic. It’s sumptuous. It’s voluptuous. But flaws in the meal prevented me from getting my head too clouded by the courtship. That fish was unforgettably fishy. The truffles were weak – that sandwich and my taglierini were sore reminders of how much better the meal would have been with decent truffles. (Would I have been better off ordering á la carte or another tasting menu? I don’t know. Would I have have been better off ordering the black truffle menu a month or two later? Probably.) And that lièvre à la royale really didn’t quite itch the sweet spot as I had yearned. At its fringes, the food at Michel Rostang was middling. The amuses bouche weren’t terribly amusing – the sardine croquette, served with a bright, tartar sauce, was the only stand-out – and the village of colorful petits fours was simply that – colorful, but not much more. Service was frank. I couldn’t decide whether I found that entertaining or refreshing. Regardless, it certainly wasn’t annoying. Our server wore her thoughts on her face, and confusion seemed to occupy her mind for most of the evening. It took a little getting used to; she approached us more like she was our housemaid rather than a professional restaurant staff member. But she did a nice job nonetheless, taking care that everything was served properly. She told us that she was off to le Bernardin in late February (2009) and would remain there for a few months. I looked for her when I was at le Bernardin at the end of March but had no luck in a reunion. There is no doubt that the meal could have and should have been better in many respects. * If you want to read more about Michel Rostang, I highly commend this interview to you. Warning: it is in French. menu. A regular order of Le “Sandwich” Tiede á la Truffe Fraîche was listed at 98€. ~ by ulterior epicure on August 12, 2009. I remember going there in the 80,s, for his Duck Press and enjoyed his the blood juice and all, does he still have this dish on the menu. @ ergagit: I don’t recall seeing it on the menu. But I have a copy of the a la carte and I’ll check for you. Servi saignante en 2 services, sauce au vin rouge liee de son sang et au foie gras, Salade de cuisses en fricasee. Right on! We too followed Julien’s recommendation and can not agree more. Unlike L’Ambroisie, I would not think twice an invitation to return to Michel Rostang. 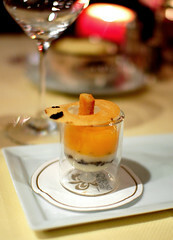 We were informed by the maitre’d that late Jan to mid Feb is usually the best time for their truffle menu. Although we went on Summer, we still enjoyed his classics dishes. I had one of the best quenelle de brochet at his table, better than the ones I had in Lyon. Same can be said about the atmosphere here. @ Will J: If there is a next time, the quenelle de brochet will definitely be one of my priorities there. I had almost considered adding that on as a supplement. Gout arthritis unquestionably must be seen as a really unpleasant condition, my own nephew is suffering from the condition for long now. It puts a lot of stress on me, observing a much loved member of the family suffer from a sudden attack often. Using an appropriate dietary regimen made for prevention and making use of adequate treatment methods is in my opinion essential. Personally, I would advise anyone who is already noticing first signs of gout arthritis to by any means take this serious. You should consult a health care professional as soon as possible and alter your nutrition to prevent the outbreak of the disease. It is definitely no fun! Try to find reasonable options for therapy and stay away from purine rich foods, red meat etc as a prophylactic measure!